Yesterday, our little Bobo had an appointment at the groomers in Laurelville (with the clever Natalie at Love on a Leash). It’s not worth it to drive home so I usually have breakfast while I’m waiting. 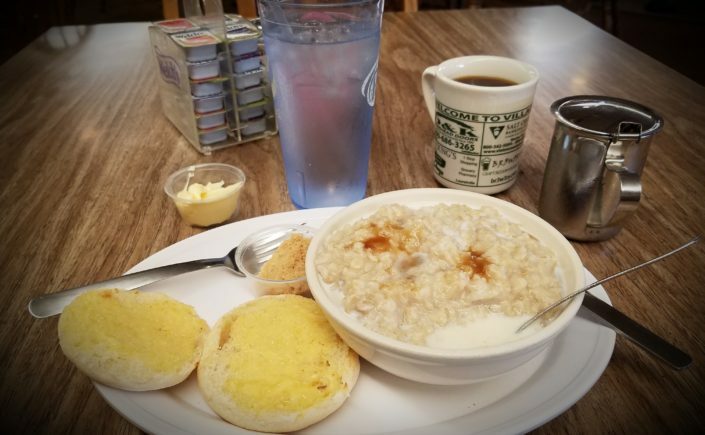 I decided to have a relatively healthy breakfast so went to the Village Cafe for their BIG bowl of oatmeal, served with brown sugar and milk. I always get a well buttered English muffin to top things off. The healthy part comes in using only a teaspoon of the sugar. There’s a full breakfast, lunch and dinner menu at the Village Cafe. I particularly like their chicken salad sandwich, and the daily specials are pretty good. Service is prompt and friendly. Always. Hours are generally 6 am to 9 pm, but it’s always a good idea to call ahead: 740-332-6415. Located on State Route 56 in the village, but official address is 16039 Water St., Laurelville. Like most of Hocking County, we lost power on Wednesday, January 28. While others came back on line day by day, our power was not restored until Monday, February 2 (by which time the damn groundhog had seen his shadow). We were pretty well able to deal with the loss of electric heat with our various woodburning appliances, a dependable kerosene heater, and propane gas stoves, but the lack of water – you need electricity to run the well pump – was the most difficult to handle. Especially when you’re trying to keep horses and goats watered. By Sunday, I was scooping water out of our creek, and trying NOT to worry about what our neighbors upstream were putting in. So we survived, and kept very busy. In addition to all the fire-stoking and water carrying, we worked a puzzle, read a lot more than usual, and went out to breakfast and dinner every day but one. Fortunately, Laurelville had power so everything was open, except one day the library was closed. We’re grateful to the Ridge Inn for its excellent free wireless network (and we discovered their fabulous croissant french toast) and to the Village Cafe for filling our water carriers and for their tasty home fries. But we’ve decided we are going to get a generator! UPDATE 2016: while the Apple House is still offering great apples, slushies, etc., Thorneybrook Farms closed several years ago. They were open for a few weeks this spring to sell flower and vegetable plants but we are not sure if they will do that again next year. The Apple House in Laurelville, on Route 56 in the village, has great apples, but is also offering apple slushies and parched corn. We haven’t tried them yet, but recent guests told us they are quite tasty. About 4 miles east of Laurelville on Route 56, Thornybrook Farms has pumpkins, gourds, mums & other plants, delicious homemade cinnamon buns, apple dumplings and bread. They aren’t open every day, but usually Friday-Sunday.